Formax Prime Review & Complaints 2019 - Safe or Scam? Demo? App? Fees? Formax Prime, or just Formax, is a pure forex broker meaning they only provide currency pairs and no other products such as CFDs, futures, or cryptocurrencies. Obviously, this is great for forex traders since the broker has put all of their energy into offering the best forex platform out there. That being said, there is much more to Formax than “just a forex broker” and on the following page, we’ll walk you through the broker and all of its services. We’ll guide you through the different platforms on offer, the assets provided, and everything else you need to know before signing up. For example, does Formax offer a demo account? And how do you contact the broker in case you need help with something or answers to questions regarding their services. So, without further ado, let’s get started with our Formax review. Unlike most brokers that we recommend and review, Formax does not offer a combination of CFD and forex trading. Instead, this is a pure forex broker that only offers currency pairs and no other assets. For some of you that might sound limiting, but the truth is that the forex market is the biggest market in the world and there are many traders that aren't interested in CFDs. If you are one of the "pure breed" forex traders, then this broker is for yours. With a Formax account, you won't be distracted by tools and features that you never use and you get to use a service that has been developed with your needs in mind. Is Formax Prime a Scam? No, Formax is not a scam but a fully regulated and licensed forex broker based in the United Kingdom. The broker’s main license is from the Financial Conduct Authority (FCA) which happens to be one of the strictest regulatory bodies in the world. The FCA’s purpose is to oversee the forex and CFD market and ensure that the brokers in the industry are safe and fair. The oversight from the FCA includes how Formax handles their customers’ money and information as well as the prices and spreads offered on their platform. Any broker that is licensed by the FCA can be considered completely safe, and Formax is no exception. With that out of the way, let’s continue with the rest of our broker review. 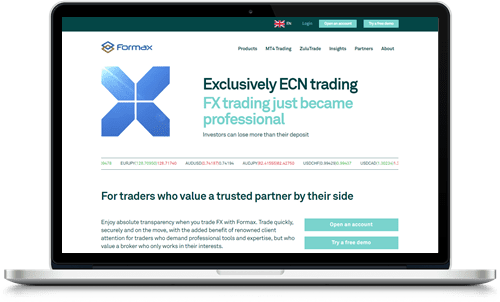 Today, Formax offers access to the two most popular forex trading platforms on the market, together they create an incredibly comprehensive forex experience. The MetaTrader 4, also known as the MT4, is the king of forex trading platforms. The majority of all forex and CFD brokers today have integrated the MetaTrader 4 in their product and for good reason. Not many platforms have the same extensive selection of analytic tools, charts, and investment opportunities. In addition, the MT4 can be used for automated trading, demo trading, and trading on the go via an industry leading mobile platform. To us, it comes as no surprise why the MetaTrader 4 is considered the best forex platform in the world. ZuluTrade is also a really good forex trading platform, although it is much less known than the MetaTrader 4. Unlike the MT4, ZuluTrade was designed for copy trading where your job is to find other successful traders and copy their investments, instead of having to analyze the market on your own. Not only that, but ZuluTrade is also the largest forex sharing network in the world. Typically, copy trading is either something you love or you hate, and if you’re into it, ZuluTrade is one of the best platforms. Both the MetaTrader 4 and ZuluTrade are available on mobile devices. That means you can sign up for a Formax trading account today and then trade wherever you are using your smartphone or tablet. Now, we have used both platforms on mobile devices, and we have to admit that the MT4 is the better option for mobile traders. The problem is that ZuluTrade can feel a bit limited and the interface is slightly confusing on a mobile screen. As mentioned, Formax is a forex broker and they don’t offer any instruments besides forex. Now, this is definitely not a bad thing, at least not if you’re a forex broker. That being said, Formax offers the opportunity to buy gold, silver, and platinum as pairs with USD which is kind of a hybrid product of commodity and forex trading. Also, we have been in contact with Formax, and according to the support team there has been a discussion about adding other assets but there has not been a definite decision to do so and there is no estimated time on when this could be done. In total, there are over 60 currency pairs that you can invest in ranging from popular pairs such as USD/EUR and GBP/JPY, to smaller ones such as USD/TBH, and EUR/SEK. Also, spreads are highly competitive on some of the pairs with the lowest being 0.2 pips. Generally speaking, Formax is transparent with their pricing and the terms that apply for the different assets, and we get a very honest feeling from the broker. Formax has two slightly different trading accounts that you can choose between depending on what you’re looking for. The first account is called the ECN Commission Free which is a standard ECN forex account with no commission. The minimum deposit is $1,000 and the lowest spread is 0.6 pips, you also get access to 24/5 customer service, automated trading opportunities, and the two trading platforms we mentioned earlier. The second account is called ECN Raw. This account is not commission-free with charges starting at $3 per lot, however, spreads are much tighter at 0.2 pips and up. In addition, to the features offered for the standard account, ECN Raw has prioritized withdrawals and personal managers that can be contacted around the clock Sunday night to Friday night. Like most brokers these days, Formax also offers a demo account. You can open a Formax demo account for either the MetaTrader 4 or the ZuluTrade platform and try them out or compare them to each other. We have always been big fans of demo accounts since they give traders the opportunity to improve their skills and trade at their best, all the time. Therefore, we encourage you to open a Formax demo account today regardless of your previous experience as a forex trader. Formax has the same payment methods as all other regulated brokers, and if you’re not sure what that means we’ve listed them below. Credit/debit cards – Use your Visa or Mastercard to fund your account. Bank Transfer – You can also perform a regular bank transfer. E-Wallets – In our opinion, the most practical way to deposit money is by using Neteller or Skrill. Extra – Union Pay is also an option if you would prefer that. Note that the same methods are available for withdrawals with the only difference being slightly higher fees and longer processing times. During our research for this review, we contacted Formax on a few occasions and we always got the help we needed in a timely manner. In fact, we would argue that Formax support could be one of the fastest, and definitely the most polite customer service we’ve been in contact with. Otherwise, you can use more modern contact channels. But that’s not all. You can also request a call back at a time when you know you will be available, or you can do as we did and use the live chat feature. Are you a European forex trader that is looking for a broker? Then we would suggest you give Formax a try. It’s an overall great broker with a good selection of assets and two renowned trading platforms. Personally, we really like the fact that they offer copy trading since it is something we don’t often see. And, even though we know this is a forex broker and that the people behind it are dedicated FX traders, we wouldn’t be disappointed if they added a few more instruments to their selection in the future.